The NIA had arrested the seven on charges of criminal conspiracy and waging war against India on July 24. A court here on Tuesday extended till November 14 the judicial custody of seven Kashmiri separatists arrested on various charges, including receiving funds from Pakistan to sponsor terror activities and stone-pelting in Jammu and Kashmir. During the in-camera proceedings, District Judge Poonam Bamba extended the judicial custody of Aftab Hilali Shah alias Shahid-ul-Islam, Ayaz Akbar Khandey, Farooq Ahmad Dar alias Bitta Karate, Nayeem Khan, Altaf Ahmad Shah, Raja Mehrajuddin Kalwal and Bashir Ahmad Bhat alias Peer Saifullah. On July 24, the National Investigation Agency had arrested the seven on charges of criminal conspiracy and waging war against India. 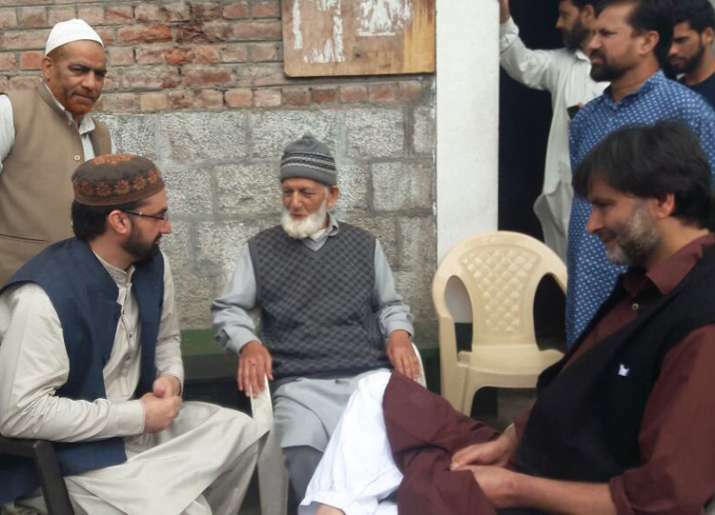 Altaf Ahmad Shah is the son-in-law of hardline Hurriyat leader Syed Ali Shah Geelani, who advocates Jammu and Kashmir's merger with Pakistan. Islam is a close aide of moderate Hurriyat leader Mirwaiz Umar Farooq. Khandey is the spokesperson for the Geelani-led Hurriyat. Meanwhile, the court also extended judicial custody of a businessman Zahoor Ahmad Shah Watali and two alleged stone-pelters Javed Ahmad Bhat of Kulgam and Kamran of Pulwama for 30 days. The NIA had on September 5 arrested the two alleged stone-pelters in connection with an ongoing probe into terror funding to stoke unrest in the Kashmir Valley. Arrested in mid-August, Watali is accused of acting as a conduit for channelling funds for separatists and terror activities in the valley. He was allegedly collecting funds from Pakistan and banned terrorist organisations and transferring the same to various Hurriyat leaders. Watali is known to be friends with Pakistani leaders as well as separatists, besides the mainstream politicians in Kashmir, the NIA said. The court will deliver order on the bail plea of Kashmiri separatist leader Nayeem Khan and Watali on Tuesday evening.